Another horror story about sun beds and the desire to be ‘brown’. Laura May McMullan spent years under sunbeds and sunbathing on holiday trying to achieve the ‘mahogany’ look she aspired to. Like so many other people she couldn’t accept her natural look and wanted to have a darker complexion than nature intended for her. There is a heavy price to pay for altering your skin’s appearance. 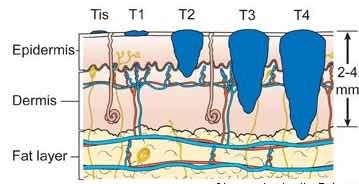 If a diagnosis of melanoma is confirmed it is a bad prognostic indicator (measure of how well or badly the disease will go) as you can see in Laura May’s case, the disease is quite invasive and usually spreads pretty quickly. Even the diagnostic procedure (Sentinel node biopsy) leaves the person with troublesome swelling in the affected limb. 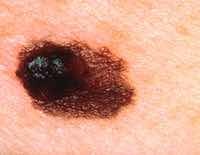 Survival rates for a diagnosis of stage 4 melanoma is depressing. Whats more depressing is the amount of people like Laura May who believe that ‘it will never happen to them’ and continue to ‘sun worship’ until its too late. Surely its to accept natures intended complexion fir you as an individual than to play a game of Russian Roulette with your life for the sake of vanity – its your choice! You can read Laura May’s story here.